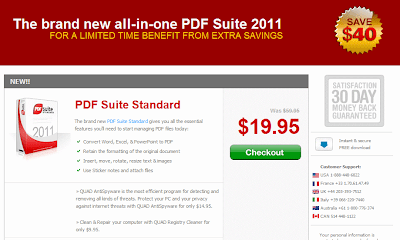 My friend Dennis liked the free trial of PDF Suite 2011 Standard, and when he got an email from them offering the $59.95 product for "only" $19.95 he decided to buy it. They deducted $52.80 from his credit card instead. So much for the $40 savings. So now he is reversing the transaction and they get nothing, except a bad reputation. Their "get-pdfsuite.com" web site adds in other stuff to the $19.95 order, and unless you read all the greyed-out text carefully you find yourself buying a whole load of junk you didn't want. I have suggested using Nitro PDF instead. At least they don't try to steal money from their customers. Their full product costs $99.99 which is still a lot cheaper than the $345 Acrobat X Standard product from Adobe. 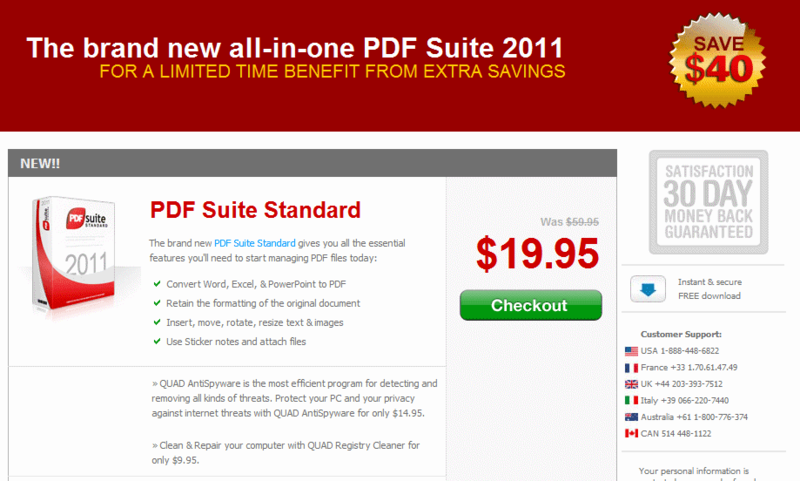 I received an email where I was offered to purchase the PDF Suite 2011 for $19.95. After I gave them my credit card I found out that they actually charged me $42.85. Not only that! They also promised to email me the product key within 5 minutes so I could use the product. I never got the key either. My bank told me it was too late to reverse the charges! What a scam! And Ripoff!!!!! There should be a contact email for the company that handles the credit card transactions. I'm sure they'll reverse it for you. Thank you for this info. I was going to purchase this product, but I always do a search query before I buy. I hate getting ripped off and I appreciate that you took the time to post this. I just had a very peculiar experience, and I think you should know about it. I called the US service phone number for pdf-suite, which I got from their web page: http://www.pdf-suite.com/support.aspx?lang=en 1-888-448-6882 . All I wanted is to find out how to download pdf-suite, which I had bought back in 2011. Instead of just telling me how to do this (which was rather easy, I found out later when I went back to their web page), he got me to download an app which enabled him to control my computer, and started looking at my installed apps, then went and looked at the Task Manager. He went on about how the available memory is way too low, said 21 errors were being generated every 5 min, and how the indications were that someone is sharing my internet connection; then went to devmgmt.com and talked about how a bunch of drivers had crashed and I could expect more, and how maybe there are a lot of trojans. He suggested I should take it to a Microsoft Certified Technician, and they would fix it for around $90. Then he said that for only a lifetime fee of $99 he could offer me continuing maintenance for not only this but my laptop as well. Well, I said, I only called with regard to pdf-suite, not this. And I don't know who you are. He said something about their company is called Solid Tech, which I immediately tried to look up on Google, and got nothing even remotely resembling such a business. At this point he still had control of my computer, so I made him close that, and I got off the line. Then I deleted the exe programs he had me download and looked it up again on the internet, with the same results. Then I started looking for an address to write to pdf-suite telling them all this and guess what I could not find ANY information about the company behind that software.